Students working on the 3D printer. Not sure what she had in store in the future, Ms. Chappell began working as a sales representative for a pharmaceutical company. Although she had passion for her job at the time, she began to grow tired of the daily routine and began searching for other alternatives. After her work in sales, she majored in Family Consumer Sciences and began to teach the course at South Miami High School. 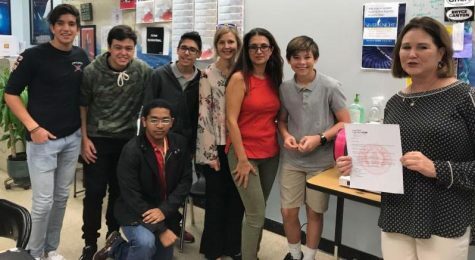 Her strong ties to business led to her begin teaching as a Digital Design Teacher at Coral Gables Senior High, where she has been working ever since. Ms. Chappell stands with her students. 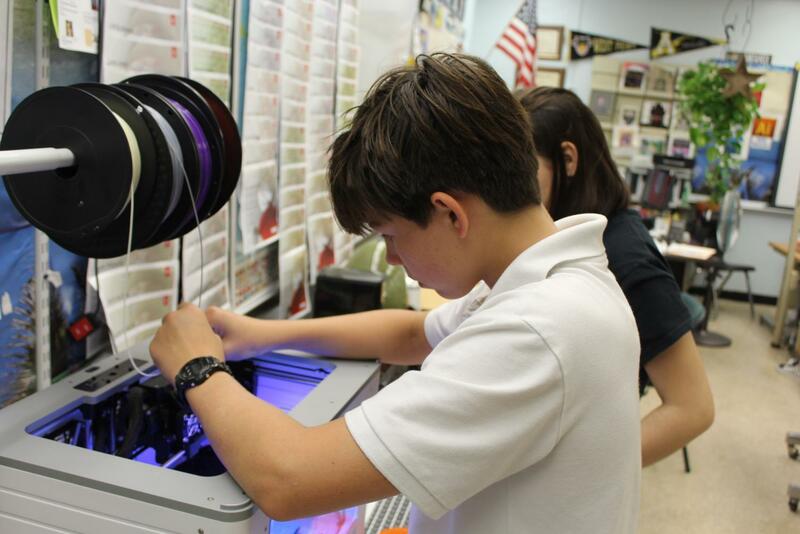 After stumbling across an old 3D printer in her closet, Chappell was inspired to purchase a 4-color 3D printer with the mini-grant funds she received from the PTSA. This would serve to offer her digital design students a different perspective on 2D objects. Throughout the course of the year, students gain different Adobe skills that they incorporate into Tinkercan—a program that allows students to design their three dimensional object. When this idea became a reality, her main goal was to provide to students a different and more interactive way of learning digital design since using the printer can, at times, require a lot of critical thinking due to all of its troubleshooting. This will help students gain more knowledge on the different ways of designing and can potentially be beneficial to them in the future when it comes to working in digital design. “It is another learning tool that they can add to their resume. It is one thing to add 2D work to your resume, but 3D work is totally different since there is a lot of troubleshooting. In other words, if things do not work, for example the third piece was not working so we had to figure out why, there is a lot of critical thinking that goes on in this that would not go on when you just develop on a screen,” Ms. Chappell said. The 3D printer Ms.Chappel was able to purchase with the mini-grant she received. Throughout the course of Ms.Chappell’s beginning digital design and information class, students can learn several critical thinking skills through the use of Adobe In-Design and Illustrator. When it comes to those students who are just beginning digital design, they learn how to use Excel, Word and Powerpoint—skills that they can incorporate in to everyday assignments. Despite being the teacher, in some ways Ms.Chappell is a student herself. On a daily basis her students expose her to new topics and ideas that she would normally not think about. At times when it came to the 3D printer, her students were the ones who worked together to fix the printer when she was not able find a solution for problems the printer was experiencing. “My students teach me a lot. Like James has his own website and has tutorials, which makes it a lot easier for our Tinkercan because that means I do not have to do all of this myself. From the ground up he has taught me a lot and in troubleshooting. When Adobe is not working, three people can look at it and one person figures it out, so you have a lot of different perspectives when you are working with an artsy type program,” Ms. Chappell said. As Ms. Chappell and her students continue to learn about the printer, she hopes that she can potentially work with the Engineering Club to create various interactive projects that her students can participate in. In addition, she wants to combine their students with her digital design students to create more parts as many of them share the same passion for design and robotics.